The C-class literally got off to a flying start – in 1983, four weeks before its presentation at the Frankfurt International Motor Show, three prototypes of the Mercedes-Benz 190 E 2.3-16 set long-distance world records on the Nardo circuit in southern Italy for 25,000 kilometres, 25,000 miles, and 50,000 kilometres, at average speeds of almost 250 km/h. This was an initial foretaste of the 190’s future career as a sports car. The new Silver Arrow had its racing debut in the official opening race on the new Nürburgring racetrack on May 12, 1984. Mercedes-Benz lined up 20 identical 190 E 2.3-16 cars for the occasion, following a press trial driving presentation on the reconstructed track just a few days earlier. The cars at the premiere race were driven by 20 former Nürburgring winners and other great racing drivers who had been successful either in the German Grand Prix or the 1,000 km race. This select band included Jack Brabham, Hans Herrmann, Phil Hill, Denis Hulme, James Hunt, Alan Jones, Niki Lauda, Klaus Ludwig, Stirling Moss, Alain Prost, Keke Rosberg, Jody Scheckter, Ayrton Senna and John Surtees – virtually a “who’s who” of motor sport. Each was at the wheel of a 190 E 2.3-16 that was virtually identical to the production version in terms of appearance and engineering. The most striking difference in the racing version was the integrated anti-roll cage. The winner of the opening race was Ayrton Senna, then just 24 years of age, who at the time was making a name for himself as an up-and-coming star in Formula One. 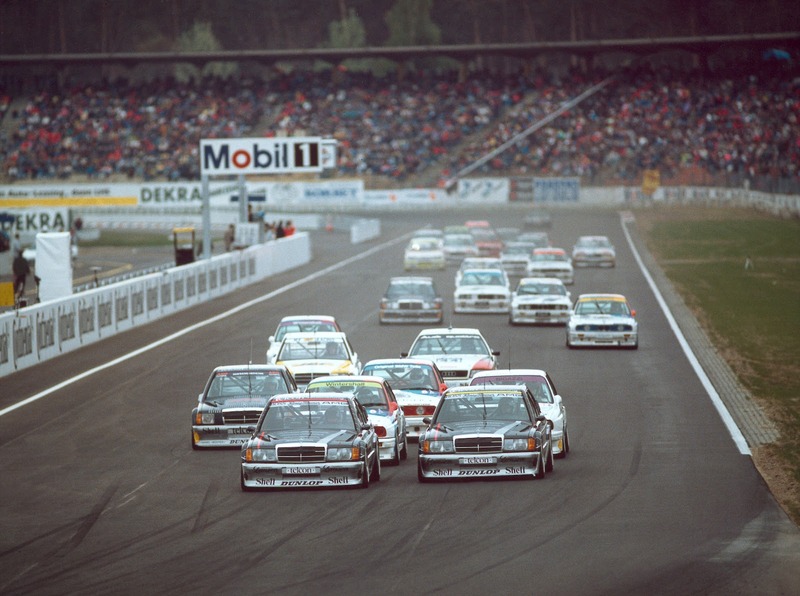 The 190 E 2.5-16 also became the basis for the racing cars entered in Group A of the German Touring Car Championship (DTM). The only component of the production car that failed to satisfy the DTM racing car designers was the engine – racing engines have to meet some clearly defined requirements, such as a specific bore/stroke ratio. The four-cylinder engine in the production version had a particularly long stroke, making it unsuitable for the very high engine speeds required for racing, and there was too little scope for boosting output. So the decision was made to design a completely new engine which, however, had to have the same displacement as the production version. Not only the professionals driving the Silver Arrows based on the 190 benefited from this new development. The engine was also available to individual buyers looking for real power under the hood, in the 190 E 2.5-16 Evolution, a road-going version of the sports car. This was because under the rules of the FIA, the governing body of international motor sport, a new engine would be accepted only if its basic version was fitted to a type-approved production vehicle. At least 500 cars had to be manufactured with the new engine, and so the Mercedes-Benz 190 E 2.5-16 Evolution was designed with the M 102 E 25/2 engine which was then further modified for racing. Accordingly, in 1988, Mercedes-Benz re-entered the world of motor sport with this racing car based on a production 16-valve model, after its withdrawal from the racing arena in 1955, ending the legendary Silver Arrow era at the height of its success. The result of the enhancement project was unveiled at the Geneva Motor Show in March 1989. The 190 E 2.5-16 Evolution was powered by the newly designed, high-torque, short-stroke engine, delivering 143 kW (195 hp), exactly the same power as the engine of the 190 E 2.5-16. However, the engine of the Evolution variant left plenty of scope for power-boosting modifications. The suspension was also modified for the car’s use in motor sport, including 16-inch wheels. The most noticeable modifications to the body were the front spoiler, the larger rear airfoil with its characteristic triangular wedge, and the larger wheel cut-outs with distinctively flared wheel arches. In just three months, Mercedes-Benz built exactly 502 of these cars with a blue black finish. They were sold to customers looking for sports car performance. But the designers kept working on the cars intended for racing. For example, manifold injection was replaced by electronic control (Bosch Motronic MS 2.7), and the compression ratio was raised. The racing car emerged with a power output of 245 kW (333 hp) and a maximum torque of 290 Newton metres at 7000 rpm. The next development stage came just one year later, with the 190 E 2.5-16 Evolution II. Again introduced at the Geneva Motor Show, the production car had a power output of 173 kW (235 hp) and even better performance. The designers had largely retained the suspension and brake systems, but the new car – the most powerful model in the W 201 series – was now given 17-inch wheels. There were some clearly noticeable changes to the body to reduce air resistance and increase down force at the front and rear axles. The 190 E 2.5-16 Evolution II had integrated spoilers at the front and rear bumpers, and the bodywork now included flared wheel arches integrated in the body and a very distinctive rear airfoil. The same number of just 502 units of the new model – known as the Evo II – was built in a few months. And like the predecessor, it was supplied with a blue black metallic finish. The production version of the Evo II was converted for racing purposes by AMG at Affalterbach. Preparations for the second development stage for the 1990 racing season started in August 1989, while the first Evolution version of the 190 E was still in use on the racetracks. AMG entered the Mercedes-Benz 190 E 2.5-16 Evolution II in its first race on the Nordschleife (North Loop) of the Nürburgring on June 16, 1990. 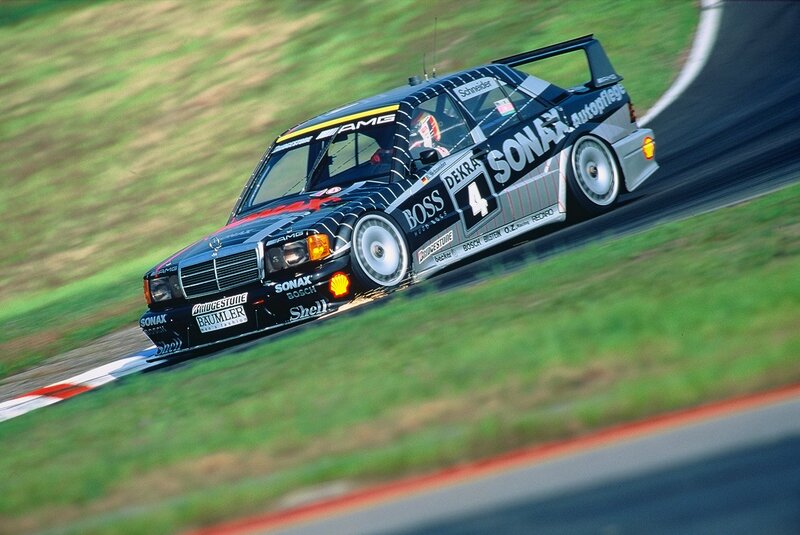 Klaus Ludwig clinched the DTM champion’s title in 1992 with the works car prepared by AMG, with Mercedes-Benz topping the brand ratings. Ludwig had been runner-up in the DTM the previous year. The final development stage of the W 201 series for motor sport was completed in 1993, with the 190 E Class 1 AMG Mercedes-Benz racing car, based on the 190 E 2.5-16 production model. The new car weighed 20 kilograms more than its predecessor, had its engine set lower and further back, and some changes had been made to the body structure. Engine performance was the same as in Evo II, however. The W 202 series also took the Mercedes-Benz star out onto the racetrack when the new AMG-Mercedes C-Class with six-cylinder engine was entered in the DTM championship in 1994. Klaus Ludwig drove the new car to victory in the championship in its very first year. The body might have been that of a C-Class, but the engineering was totally focused on performance on the racetrack. The V6 engine, developing 294 kW (400 hp), was based on the 4.2-litre V8 power plant from the Mercedes-Benz S-Class. This was followed in 1995 by a new version of the AMG-Mercedes C-Class racing car. In comparison with the 1994 version, the driver’s seat was moved further back and toward the centre of the car. This enhanced driver safety, and the car’s stability was increased by the integration of the anti-roll cage in the body. The structure now had up to 300 percent greater rigidity than the production version. Powered by a V6 engine developing 324 kW (440 hp), the C-Class again came out tops in the DTM championship in 1995, with Bernd Schneider winning the title ahead of teammate Jörg van Ommen as runner-up. AMG then built another racing car in 1996 for the International Touring Car Championship (ITC), again based on the C-Class. The 2499-cc V6 engine delivered 368 kW (500 hp) for a top speed of 320 km/h. Bernd Schneider finished the ITC season as runner-up. 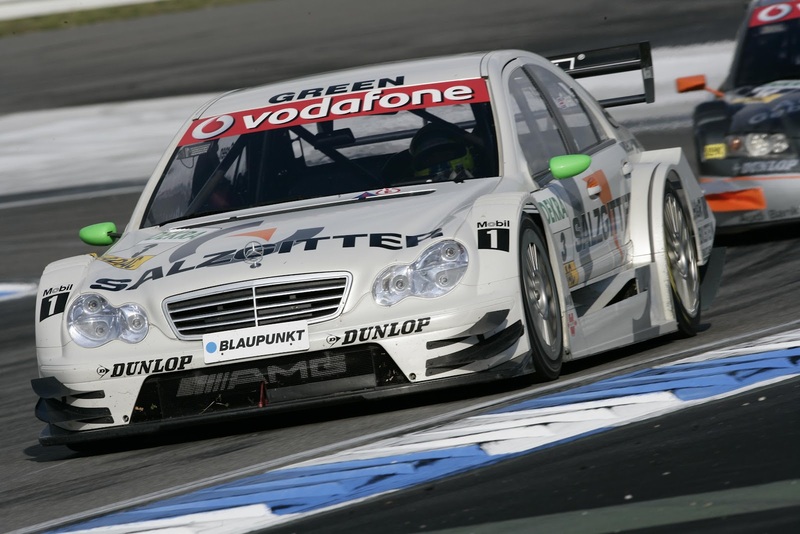 Mercedes-Benz has been involved in the German Touring Car Masters (also abbreviated to DTM) since 2004 with another racing car based on the C-Class. The AMG-Mercedes C-Class was introduced in 2004, just one week before the presentation of the revised road-going version of the C-Class W 203. The car replaced the AMG-Mercedes CLK with which the Stuttgart-based manufacturers had been so successful in the DTM since 2000 (championship victories in 2000, 2001 and 2003, runner-up positions in 2001, 2002 and 2003, third places in 2000, 2001 and 2003). The AMG-Mercedes C-Class had the same engine as the CLK in use since 2000. The engineering team headed by Gerhard Ungar, Chief Engineer at HWA, had further boosted the output of the four-litre V8 engine and adapted the suspension to the four-door car. Mercedes-Benz finished the 2004 DTM season with Gary Paffett driving the AMG-Mercedes C-Class as runner-up and Christijan Albers in third place. Paffett went on to win the series in 2005. 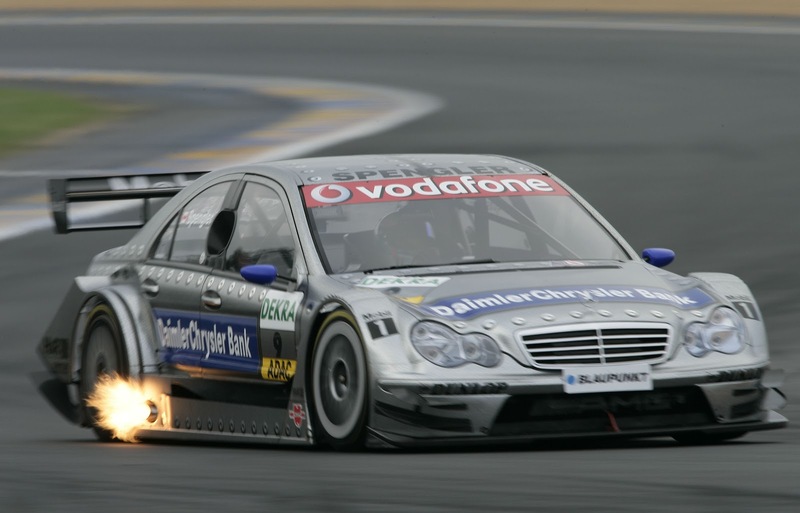 And in 2006, Bernd Schneider took out the championship in the latest model of the AMG-Mercedes C-Class, becoming DTM champion for the fifth time. Bruno Spengler was runner-up, also in an AMG-Mercedes C-Class. The car was powered by a four-litre V8 engine delivering 350 kW (476 hp). Mercedes-Benz has been racing the touring car based externally on the C-Class from the 204 series since 2007. Its greatest success to date came in 2010, when the race department notched up a triple victory for Mercedes-Benz in the DTM: Paul di Resta took the title, followed by team-mates Gary Paffett and Bruno Spengler. 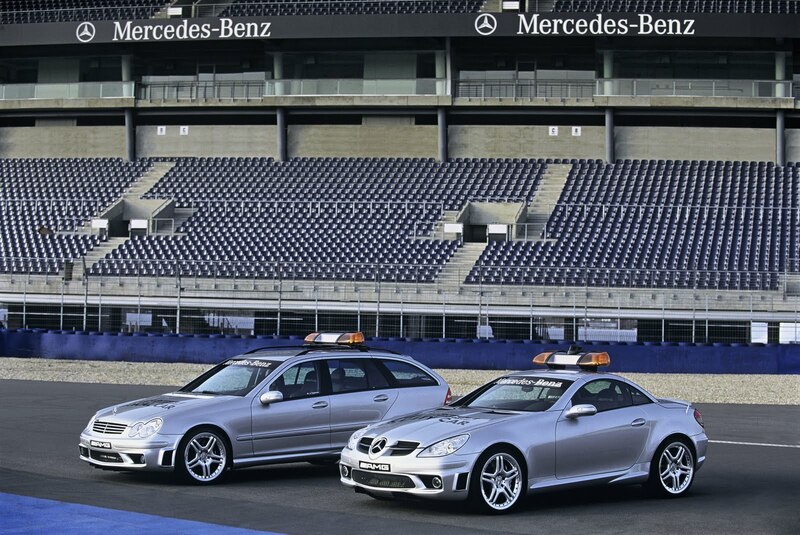 The Mercedes-Benz C-Class is even represented in Formula One racing. The Medical Car has been a C 63 AMG Estate since the 2008 season. 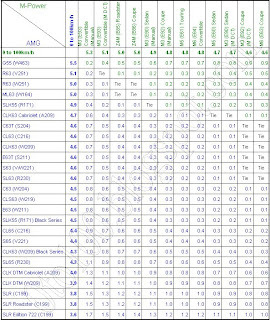 Its predecessors from the C-Class ranks were a C 55 AMG Estate from the S 203 series (from 2004), a Mercedes-Benz C 32 AMG Estate from the S 203 series (from 2001), a C 55 AMG Estate from the S 202 series (from 1998) and a C 36 AMG from the W 202 series (from 1996). The C 32 AMG Estate as the F1 Medical Car can be seen in the Mercedes-Benz Museum in Stuttgart.